The wonder of the Laguna! the mystique of the blue hole! The serenity of Ras Abu Galum! 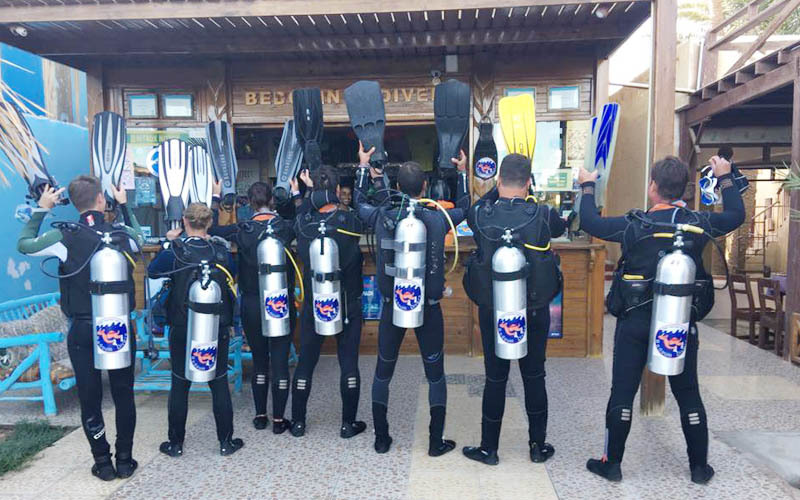 When you dive in Dahab you enter a truly exotic aquatic world. 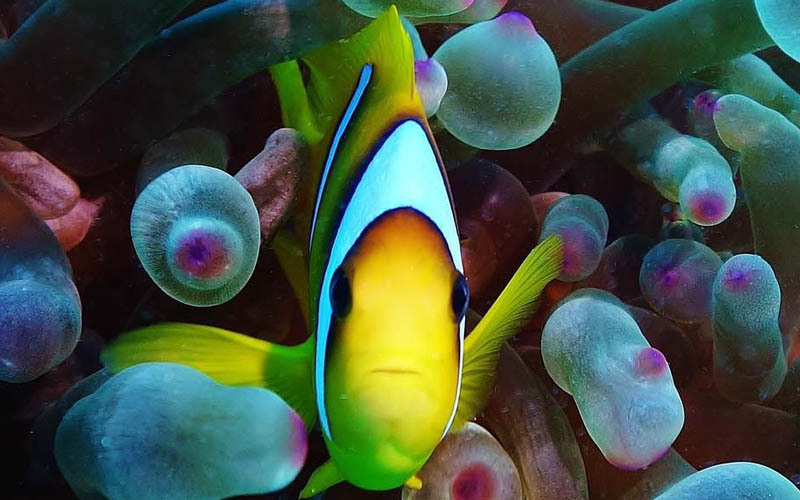 You will undoubtedly see a fabulous array of soft and hard corals, colourful fish and marine life in abundance. You may even spot a seahorse or see how rays hover above the seabed. 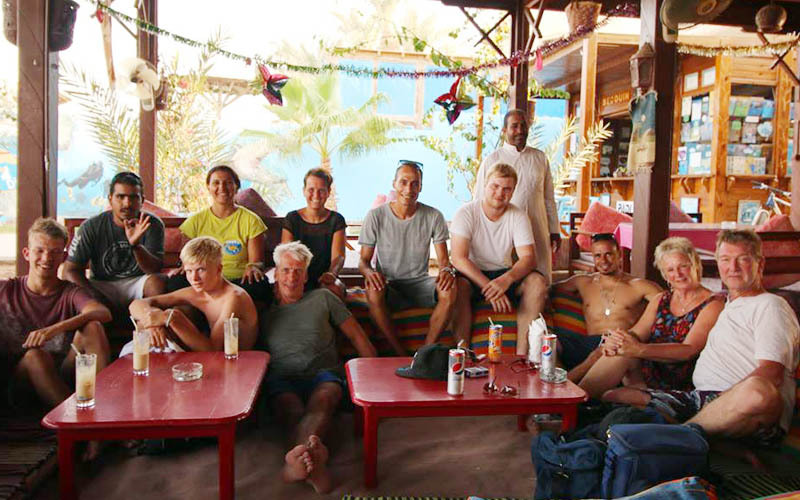 Yes Dahab is the place to dive in the area of the Red Sea and Bedouin Divers Dahab will be happy to take you there. 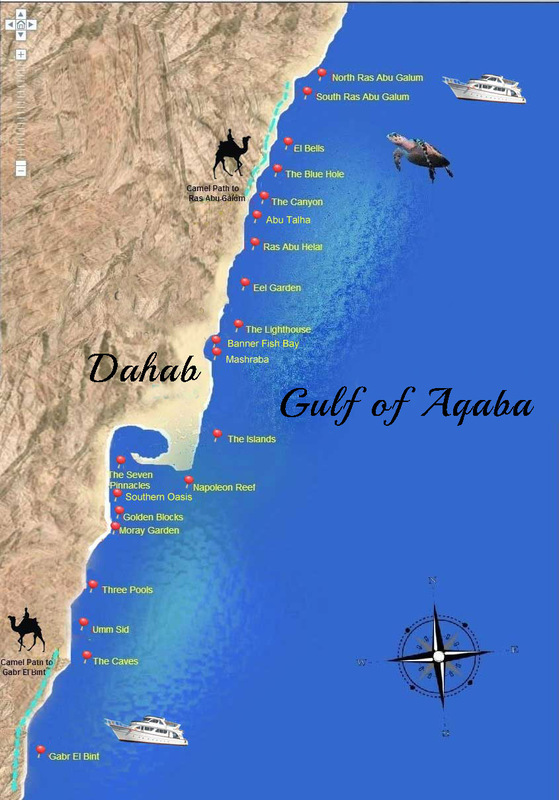 Here are the most popular dive sites of Dahab, but if you ask us nicely we just might show you some even more special and isolated ones! 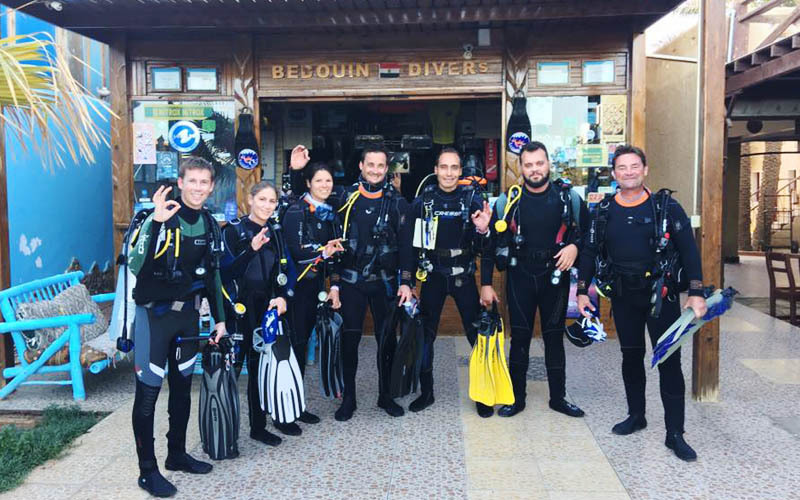 Dahab offers great scuba diving opportunities and is world famous for its clarity of water and easy entry dive sites, which are mostly coral reef gently sloping down as well as shallow coral gardens. 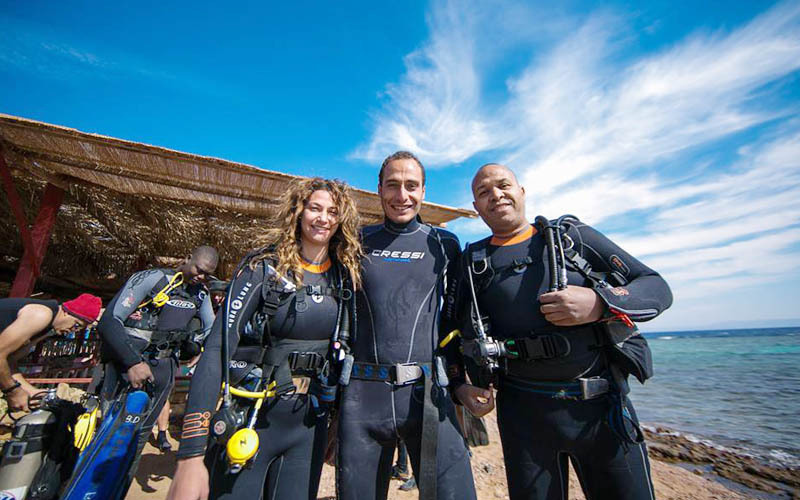 Most of the dive sites are easy, making Dahab a great place to learn scuba diving. The marine life is fantastic with all the usual reef fishes of the Red Sea and pelagic fishes like barracudas and jacks. Turtles, Rays and Dolphin are all regular visitors. 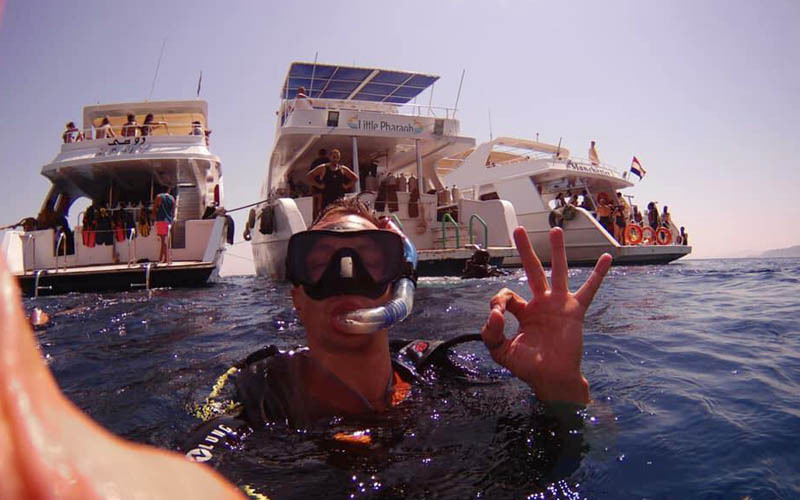 However what really makes Dahab famous is the infamous Blue Hole dive site! 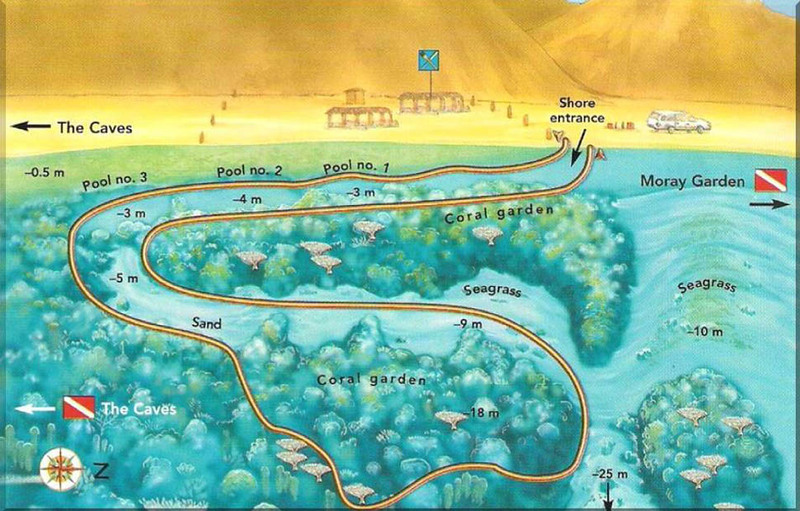 It is a large 70 m wide hole within the coral reef going down to 80 metres, with a 30 metres long arch going through the reef and out into the open sea. 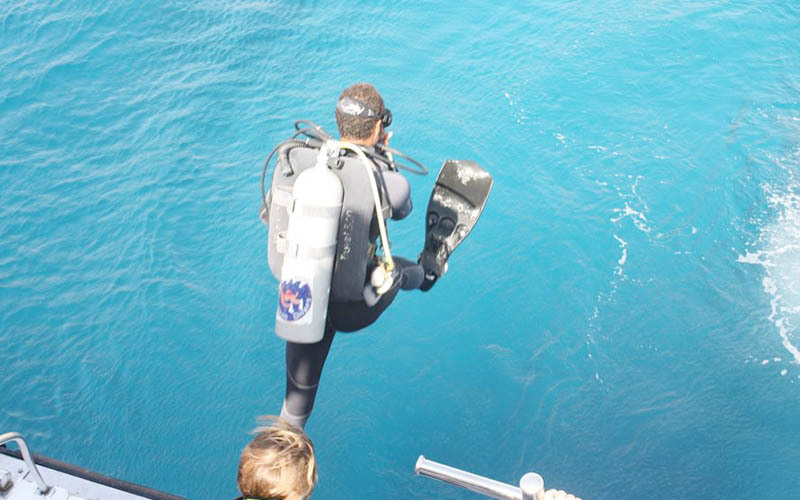 Note: It must be understood that this part of the Blue Hole and Arch dive is only for very experienced Technical Divers and should not be attempted by others. There are numerous dives at Abu Galum, however north Ras Abu Galum is probably the most beautiful and is not to be missed. It is situated approximately 8 kilometres North of the Blue Hole, connected via a path along the shoreline, and accessible by camel, boat or on foot. Alternatively it can be reached by four wheel drive through the splendid Wadi Rasasa. The clarity and the colour of the water is always amazing. The Blue Hole hosts a great abundance of coral, including Star Coral, Gorgonians, Soft coral, Black coral and Anemones (with their colourful Clown fish). You can also observe some giant sponges called ‘Elephant Ear’ before exiting the water to the western part of the Blue Hole. On occasion, looking out into ‘the blue’ from the wall, divers have been lucky enough to spot the Giant Manta Ray as they glide and swoop majestically. 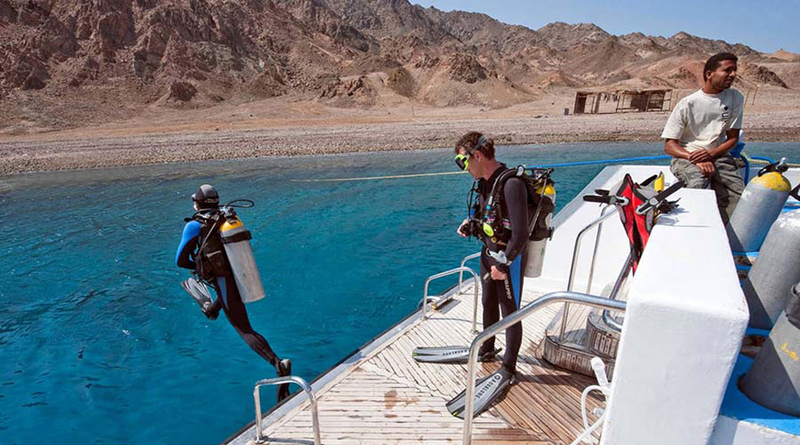 The Blue Hole is one of Dahab’s most famous dive sites and should definitely not be missed. Swimming on, you will pass a colourful coral garden to your left. This you will view on your return from the Canyon. As we approach the Canyon itself, air bubbles pour from the sea bed. This is a wonderful site and kind of like swimming through Champagne! Descending down into the Canyon, you will reach a sandy bottom, approximately 28 metres below you. Look up and admire the light effects caused by the sun rays. The Canyon itself drops back behind you to a depth of 54 meters, but we head north where a cave opens up at a depth of approximately 17 to 18 metres which accommodates a dense school of Glassfish. As you look up, the light glistens off the fish, making this a truly magnificent site! Ras Abu Helal which means ‘Cape of the Growing Moon’ is approximately 3 kilometres south of the Canyon. You enter this site, descending to a sandy lagoon with a semi circular shape at a depth between 7 and 12 metres. Keep the reef to your left and explore the underwater promontory with its’ beautiful coral garden. The fauna in this area is immense. Within the coral garden you will discover, Lionfish, Groupers, Triggerfish, Unicornfish, Butterflyfish and occasionally Turtles. This extraordinary site is south of Mashraba to the sea side of the Lagoona. Once again the reef platform is relatively wide, so it is best to enter the sea at high tide. A series of three hard coral pools with sandy bottoms are situated after the small reef edge. This area consists foremost of massive Pore Corals populated numerous species, including Snappers, Groupers, Black Spotted Pufferfish, as well as a school of Yellowtail barracuda! On occasion Eagle Rays lay on the sandy bottom and glide majestically up and away from you as you swim near. This site is situated in the Laguna, in the area known as the ‘Spit’. This site best reached by boat or zodiac as it lies approximately 450 metres away from the beach. The huge Madrepore tower is separated by a channel from the half submerged reef. It comes up from a sandy sea bed at around 20 metres and is frequented by plentiful fauna and Napoleonfish to whom the site owes its’ name. At the tip of the sand spit lies The Seven Pinnacles, often overlooked as a dive site, yet home to a rich variety of fauna and flora. 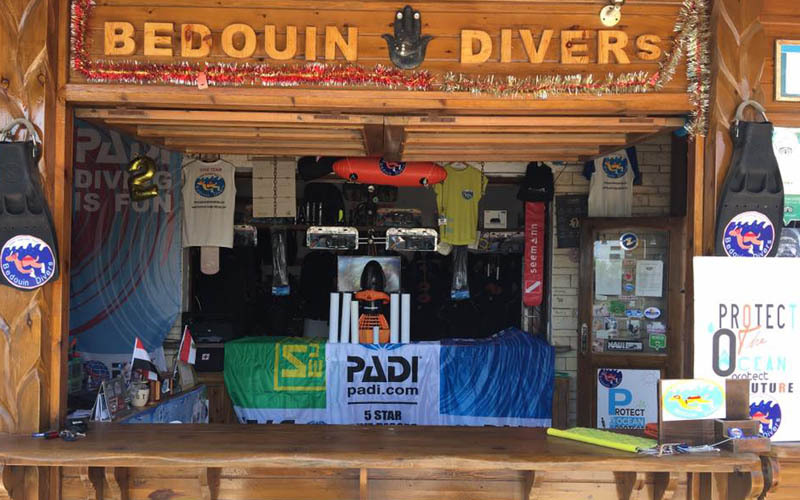 The sandy slope gives an easy entry and is ideal for novice divers. 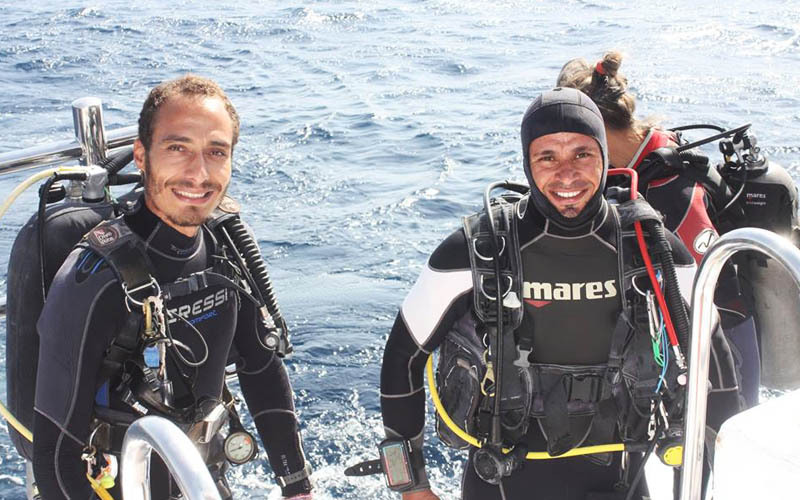 The dive is easy with a gentle decline to just over 6 metres circle the pinnacles as they rise up from the sandy bottom. The occasional turtle will swim by and say hello! 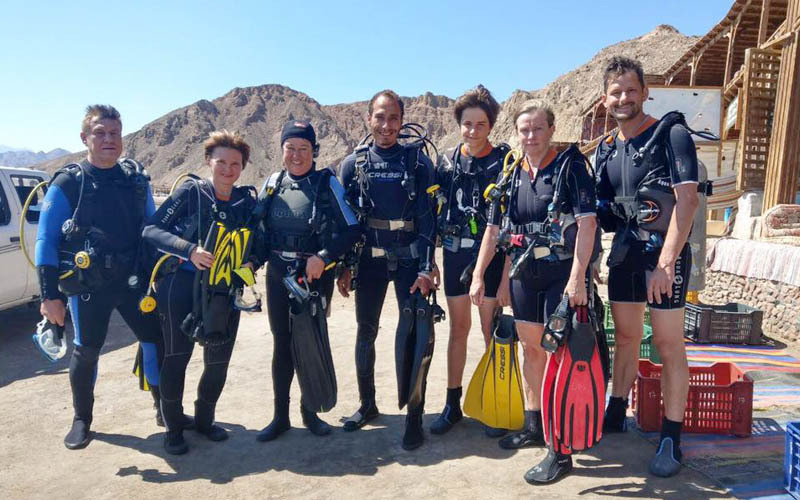 To the south of Dahab, you will find Moray Gardens and Golden Blocks, both beautiful dive sites suitable for all abilities. Moray Gardens is also known as Sharks Caves, however there are neither caves nor sharks to be found at the site, but instead one can expect to see Giant moray eels! 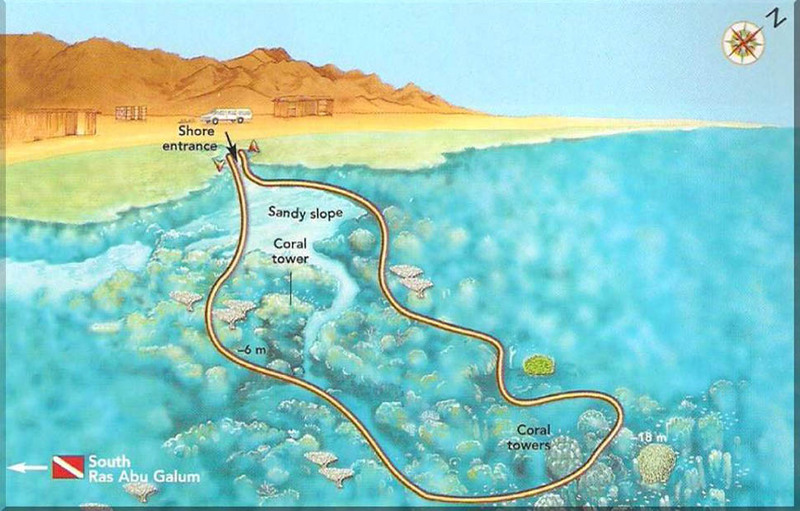 The three sandy pools interconnected by saddles of coral, form the entry and exit point for this dive. Outside the third pool you can often find young Napoleon fish before descending to the deepest point of the dive, following a sandy alley with Brain Coral, Pipe Coral and Salad Coral along the sides. The Caves is the last of the series of sites of El-Qura bay. It is found approximately 2 kilometres south of Three Pools. The entry is in front of a small Bedouin Restaurant at a crack in the reef plate. Entrance requires a giant stride off the ledge and into the blue, best dived in calm conditions as jumping off the ledge can be quite tricky when there are waves breaking on the shore. When you enter the cave, make sure to swim to the back and turn to face the entrance, where you can watch the light shine through the swarms of Anthias and Bannerfish swimming upside down on the roof of the cave! After leaving the first cave you find a red anemone, one of few in the Red Sea dive sites, so make sure you get a look! The site is absolutely stunning, and is part of the protected area of Nabq. 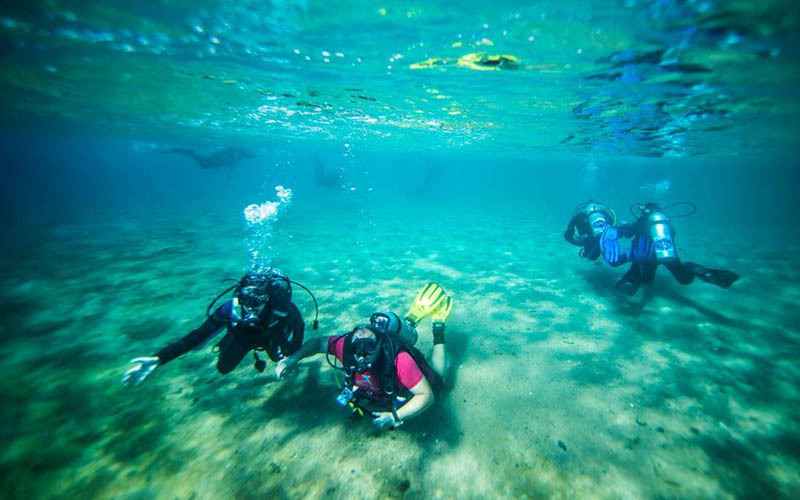 It has not been affected by tourism, and with its’ impressive mountainous surroundings and untouched coral reef, the site is truly one to experience. 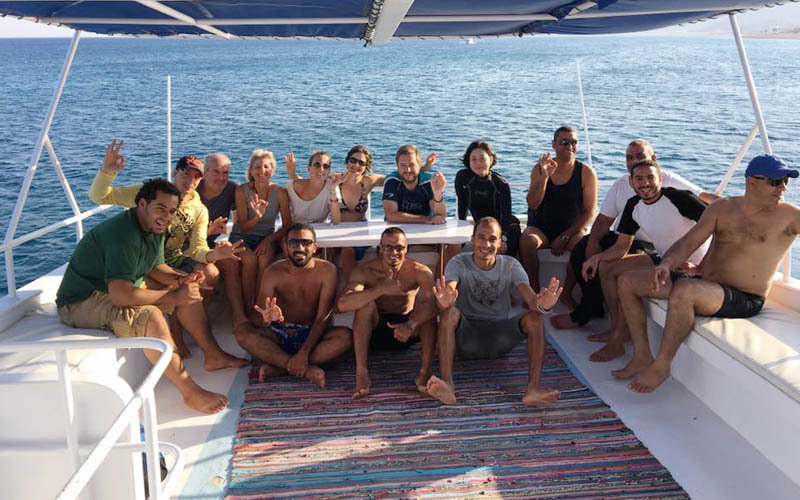 The boat ride takes approximately 60 minutes from Dahab marina and is well worth the trip. 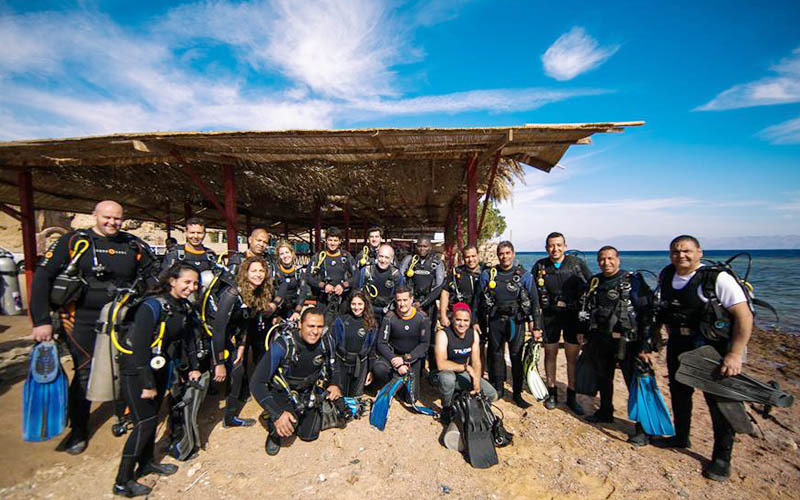 Gabr el Bint offers two dives; the one to the North of the buttress being the more beautiful of the two. It is dominated by a splendid wall which descends into the blue, and is decorated with numerous species of coral. You drop down to about 20-25 meters swimming along massive boulders protruding from the drop-off which attract dense shoals of Anthias and Glassfish. Keep a good eye on the blue where you will see Trevallies hunting shoals of Fusiliers. This dive is the more colourful of the two, with some of the healthiest Gorgonian Fan Coral in the Red Sea. When turning back, you ascend to about 10m and cross the saddle then start to head back along a sandy ledge which parallels the shore. The ledge displays some exquisite coral heads which attract numerous reef species, including swarms of Anthias, Scorpionfish, Parrotfish, Crocodilefish, Surgeonfish, Triggerfish, Trumpetfish, Puffers, Stingrays and very often a Turtle. The end of the ledge is usually home to a shoal of Black and White Snappers and Twinspot Snappers, usually swimming around at 5 to 10m. The right side is also known as the dark side, but don’t let the name put you off, the site is truly beautiful! It features a steep wall that drops down to about 60m cut by numerous chasms, sandy ravines and overhangs. The drop-off is adorned with healthy table coral and abundant marine life.